When my friend Charlie asked if I wanted some pine nuts, I said sure, but I was confused. We are a long way from the high desert home of the piñon pine. Uh, where on earth did you get them? “From around my house,” he said. “They’re all over. I’ll bring you a gunnysack full of ’em.” And so he did. Charlie wasn’t entirely sure what sort of pine he’d been collecting nuts from for years, but he thought — correctly — that they were digger pines. Pinus sabiniana, a tree now called the gray or bull pine because, apparently, the term “digger” wasn’t real complimentary to the local Indians who once used these trees for pitch and for food. Gray pines are unmistakable: Huge, spare, almost wispy, sporting gigantic cones that can knock you out or even kill you if you are so unfortunate as to be underneath one when it falls. This cone is nearly the size of a toddler’s head. Those are the nuts behind the cone. Aren’t they cute? Gray pines only live in California, and only inland. They ring the Central Valley and extend a little into Oregon. But you won’t find them on the Coast, or in any other state. They are NorCal’s answer to the great piñon pines of the desert. Oh, and for all of you on the East Coast? Sorry man, but so far as I know there are no pines east the Mississippi that have large enough nuts to be worth collecting. If I am wrong, let me know. I have ventured to the Great Basin to collect America’s finest pine nuts, those of the piñon pine (Pinus edulis) and the single-leaf piñon (Pinus monophylla). Both are trees of the desert, and are common from eastern California, Nevada and Utah to the Southwest states of Arizona and New Mexico. Keep in mind that more than 90 percent of the pine nuts eaten in American are actually from China and are from for Korean pine. 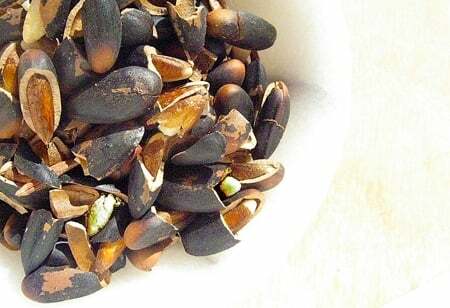 If you are lucky enough to get your hands on real American piñon or Italian pine nuts (Pinus pinea), treasure them: They are high in fat and will not give you that nasty, metallic “pine mouth” that some Asian pine nuts will. Pine mouth can last for days. Back to my NorCal pine nuts. You may notice that they don’t look like typical pine nuts. 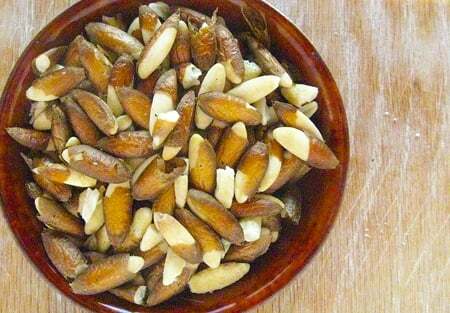 Gray pine nuts are long and slender, although they can weigh almost as much as a store-bought nut. So, you ask yourself, why isn’t someone commercially harvesting the nuts from Pinus sabiniana? Let me tell you why. 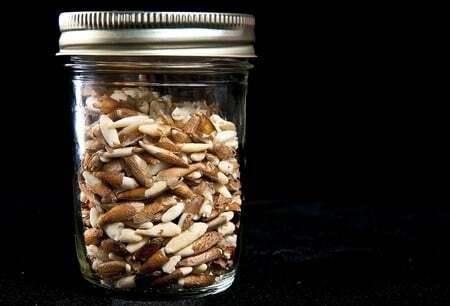 To get this little half-pint jar of nuts, it required at least 2 hours of tedious work. It starts with the cones. You collect the cones in September or October and keep them in a place that is airy, but dry; my garage was an ideal spot. 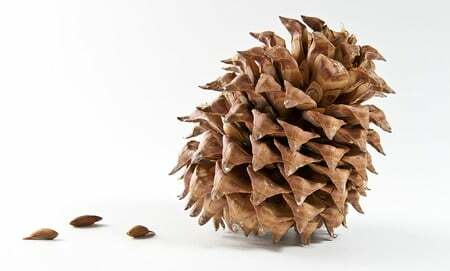 You collect the cones when they are still tightly closed — otherwise the squirrels will eat all the nuts before you can get to them. Over time, they slowly open, revealing the nut within. Your first labor is to get all the nuts out of the cones. Do this by banging them around in the gunnysack (old coffee sacks are ideal) until the nuts all fall out. Or you can whack them on your garage floor. Or you can pick them out by hand. Watch out for the resinous pitch, though, won’t come off your hands unless you douse them in oil or some other solvent. Many of the nuts will have a little wingy thing attached. This connects the nut to the cone. Toss it. You’ll notice that the nuts range from big to small, and from shiny brown to matte charcoal-black. My experience is that the darker the nut is on the outside, the better the nut is inside. Toss nuts with holes in them; some bug has gotten to it before you. To crack a pine nut, you will need vise grips. This is a main reason why gray pine nuts are not sold commercially. The shell is thick, and very, very hard. You can crack the “good” piñon pine nuts of the desert between your teeth, and some innovative souls in Nevada have designed shellers for them. These will not work with the gray pine nut, which has a shell only marginally softer than the dreaded black walnut. But the vise grips make short work of them. The shells are not circular in cross-section, they are ovals. You crack them along the thin part of the oval, setting the grips at the right spot to just barely crack the shell. You get the hang of it quickly. I can crack nuts reasonably fast this way, but it’s still work. If you don’t have vise grips, use a hammer. I found the best way to open a gray pine nut without pulverizing it was a tap-TAP! with the hammer. All you want to do is crack the shell. Once cracked, you now need to extract the nuts from all those shells. It’s not as hard as fishing out the goodies from black walnuts, but pine nuts are soft and break easily. The paper skins come right off once the nuts are out of the shell. 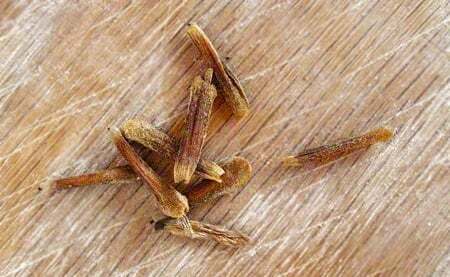 And those that don’t come off when you toast your pine nuts in a hot frying pan. What keeps you going with this process is flavor. My friend Charlie insisted that gray pine nuts were better tasting than store-bought. He’s right. Better texture, bigger pine nut flavor. Only the Italian pine nut tastes better, to my palate. Each little nut you free from its shell becomes a gold nugget: Pesto? A cream sauce for pasta? Muffins? A crust for meat? Cookies? My recipe for Pine Nut Ice Cream. 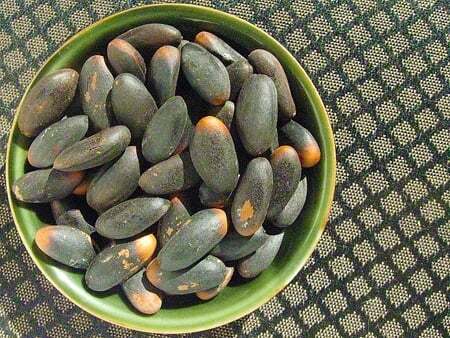 Can you use the shells of the bull pine nut as you would the pinion pine nut, to make pine nut bourbon? Greg: I haven’t but there’s only one way to find out! Our property in Lake Isabella, CA, has about 5 bull pines and once we started collecting them, we were amazed at how many pinons we found just laying out on the ground, ready to be cracked. Thanks for the tip on the vise grip. We’ve been whacking them with a brick. Thank you for the information on the edibility of Grey Pine nuts. We have property on Don Pedro Lake with numerous pines. We are spending a long weekend here and were looking forward to preparing a new recipe, Grilled Lamb Chops with Pine Nut Salsa Verde. Of course we forgot the store bought pine nuts! I got the bright idea to see if we could find some nuts from the pine cones on our trees, and guess what we did! I wanted to make sure that they were edible and found your website with all the information we needed to go from pine cone to skillet. Thank you!